This glass ½ circle aquarium is located in Sugar Land, TX and was a custom install in 2009. The dimensions of this unique aquarium are 57.5 x 29 x 29. 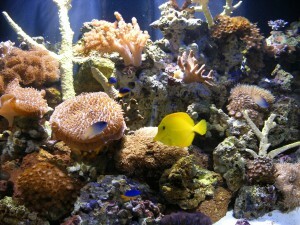 The aquarium furniture was custom made to seamlessly blend into the offices style of decor. 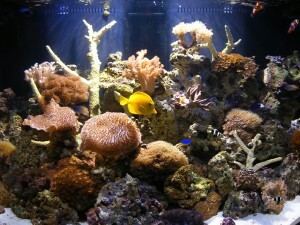 It houses an assortment of soft corals and reef safe fish.